The Bo-Keys on NPR Weekend Edition and PRI Tavis Smiley! 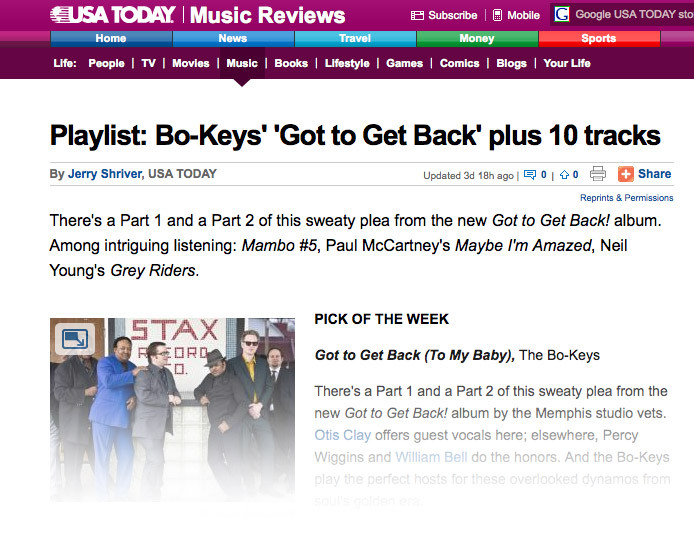 Memphis soul all-stars the Bo-Keys will be the subjects of an NPR Weekend Edition profile and a segment on Tavis Smiley’s PRI show. Meanwhile, features are on stands now in Guitar Player and Wax Poetics on the band. Electraphonic Recordings will release the tight Memphis grooves of ‘Got To Get Back!,’ the band’s first album in seven years, on June 21 on CD, LP, and download. Powerhouse guest vocalists join the band, including Stax Records hit-maker William Bell, soul/gospel great Otis Clay, classic Atlantic Records singer Percy Wiggins, and blues legend Charlie Musselwhite, who also blows some of his signature harmonica. For more information, a CD, a download, or photos on the Bo-Keys, please contact Nick Loss-Eaton at nick.losseaton@gmail.com or 718.541.1130.